George Hotz speaks to local media shortly after arriving on the RIT campus. One of RIT’s newest students has placed the university in the international news within the past week. 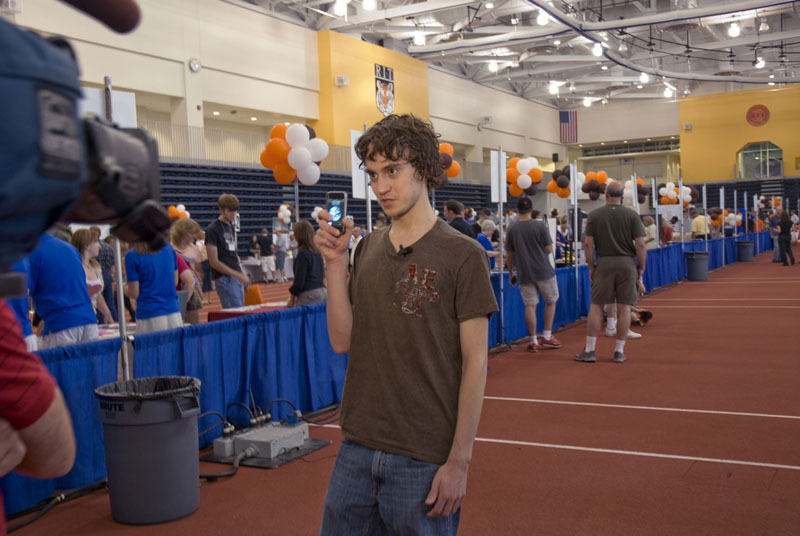 Freshman George Hotz announced Aug. 23 that he was the first to unlock the Apple iPhone, allowing it to be used on wireless networks other than AT&T, which had been its exclusive wireless provider. A whirlwind of media activity ensued. Here’s a smattering of the hundreds of news outlets that have featured Hotz since his announcement: The New York Times, San Francisco Chronicle, Associated Press, CNBC’s “Street Signs,” CNN’s “Headline News,” NBC’s “Today Show,” Sydney Morning Herald, Toronto Globe and Mail and the Financial Times UK. When Hotz arrived on campus Aug. 26, he was greeted at the Gordon Field House and Activities Center by the Rochester media. Unlocking the iPhone isn’t the first achievement to garner Hotz national media attention. His creation of a holodeck, the simulated-reality machine from Star Trek, earned him a $20,000 prize at the Intel International Science & Engineering Fair and the honor of being one of five teenagers recognized in Forbes magazine as junior innovators. Hotz is a student in RIT’s College of Science, majoring in biotechnology. He spent his first week on campus taking part in orientation activities along with more than 2,500 of his classmates—who represent the largest freshman class in RIT history.